History - Embree Sign Co. In 1912, Lloyd Embree was 18 years old and fresh out of high school. While riding a streetcar in downtown Detroit, he was approached by an elderly man dressed in a suit and tie who was carrying a sign kit. Unbeknownst to Lloyd, this gentleman was the famous Frank Quail, a successful commercial artist who worked out of an office in the Fisher Building. Mr. Quail was known for creating the logos for Fisher Body, Cadillac and General Motors Corporation, to name a few. Lloyd agreed to apprentice with Frank Quail where he learned many skills essential to the sign trade, such as lettering with golf leaf and the art of laying out designs. Lloyd had a talent for fabricating and loved to create. One day, Lloyd walked up and down Woodward Avenue where he sold six signs of his own design. He brought the sales proposals to Mr. Quail who advised Lloyd that he couldn't build the signs that Lloyd sold. Lloyd persevered and went on to build the signs in his parent's garage... and that's how it all began. 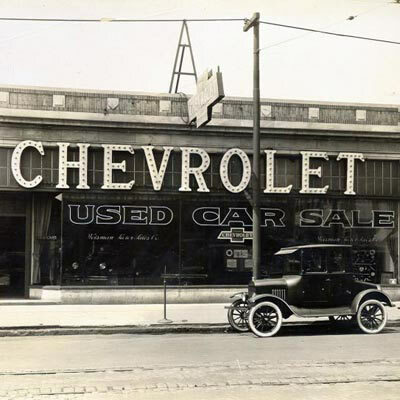 Detroit Electric Sign Company was formed and located on Woodward Avenue among other businesses that were being started by men just like Lloyd, who had a strong work ethic and a great desire to succeed. Detroit, as well as the rest of the country, was flourishing in the 1920s. Detroit Electric Sign Company became "Embree Sign Company" after receiving many misdialed calls from people trying to connect with Detroit Edison. Of course, the Sign business was much different then... from hand riveting, punching holes in angle iron for framing, making paint from red and white lead, and hand brushing everything as the roller was not yet invented. Signs were often installed with the help of Nellie, Lloyd's horse. Following World War II, Lloyd's sons, Lloyd, Jr. and Harvey, joined their father's business that had relocated to Kercheval and Fisher Road in Detroit. There they built signs for post war Detroit from 1945 to 1960. Eventually, Lloyd, Jr. pursued other interests and Lloyd and Harvey relocated further east to Harper Avenue and Outer Drive in Detroit. After Lloyd's death in 1970, Harvey ran the business. In 1979, Harvey was joined by his two sons, Dave and Steve, who own and manage Embree Sign Company today. In 1983, Embree Sign Company moved to Charlevoix in Grosse Pointe Park, our current location. We are a general commercial Sign shop that crafts a variety of high quality signage... banners, truck lettering, electric signs, LED and digital, cast letters, plaques, high density urethane and gold leaf. After 100 years, Embree Sign Company remains committed to our loyal customer base, delivering high quality products and superior customer service, always at a fair market price. We welcome your business.